Korean bingsu is a popular Korean dessert comprising of ice shavings and various ingredients such as sweetened condensed milk, fruit syrups, fresh fruits, Korean rice cake and ice-cream. Bingsu is all the craze in Singapore now and Korean bingsu cafes are popping up everywhere like wild mushrooms. 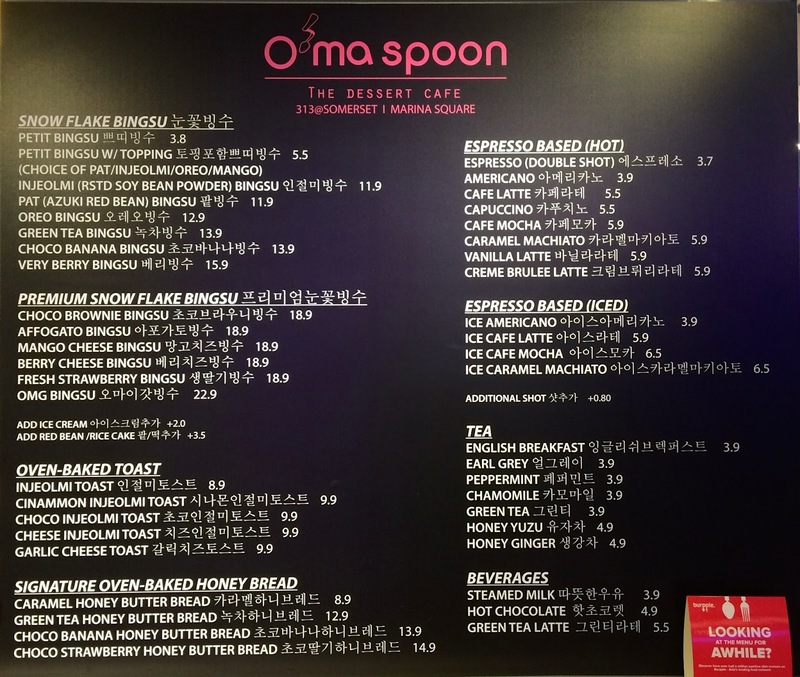 Besides bingsu, this dessert cafe also serves usual cafe offerings such as coffee and tea. I have been told that their Signature Oven-Baked Honey Bread is very good. The flavours include Strawberry & Chocolate with Ice Cream, Banana & Chocolate with Ice Cream and Green Tea with Ice Cream. 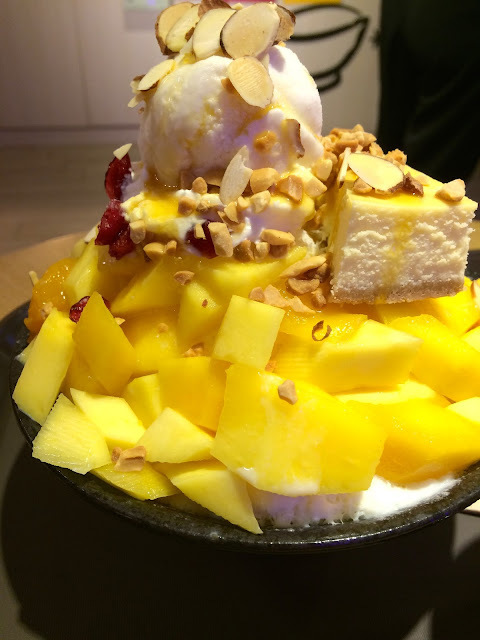 I was told that Mango Cheesecake Bingsu is one of the most popular item on the menu. Oh my, it is a sight to behold! A bowl of shaved ice is topped with sweetened condensed milk and freshly-cut mango, topped with a scoop of vanilla ice-cream and a slice of cheesecake, sprinkled with sliced almonds. The ice-cream is of premium quality, creamy and rich. My only complaint is that the mango is not ripe enough, some pieces are a little hard. The regular size is meant to be shared between two people, and the serving is huge. If you are by yourself, I would recommend that you get the petit size. I can definitely see why Singaporeans love this Korean dessert. Sweet, creamy and icy cold, it is perfect for Singapore’s humid weather. 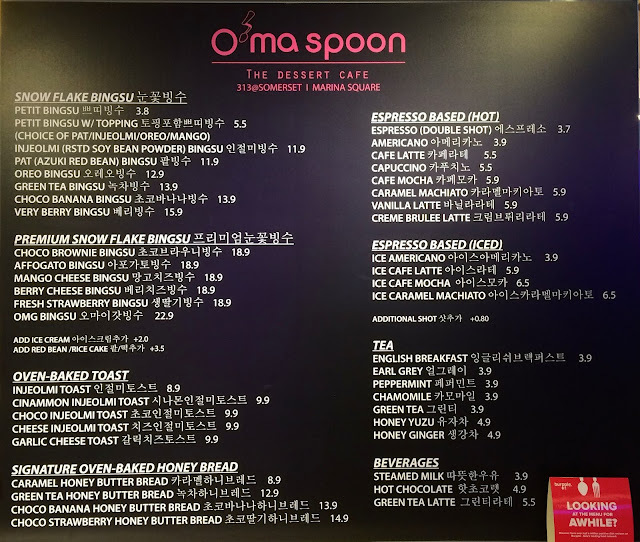 O’ma Spoon offers bingsu in the following flavours: Strawberry Bingsu, Mango Bingsu, Green Tea Bingsu, Injeolmi Bingsu, Very Berry Bingus, Patbingsu, Choco Bingsu Oreo, Blueberry Bingsu and Sweet Redbean Bingsu.